Primary Inspired: Periscope! In the Classroom! Have you heard the buzz about Periscope? It has just blown up in the teaching & blogging world world the last few weeks. 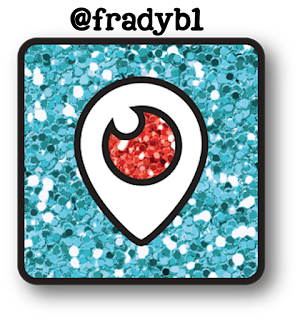 If you haven't heard, Periscope is an app that streams live video. It's connected to Twitter, so if you're already on Twitter, you'll be able to feed your live video directly through Twitter. You also can broadcast and view live videos just on Periscope. My sweet friends Angie & Ashley have great blog posts about how to get started on Periscope and 25 Periscope Must Knows. Make sure you follow them both...they'll be posting lots more great content & tutorials about the app. Periscope has proven to be a powerful tool: it's been a terrific way for teachers to connect, collaborate, & network. It's a wonderful way for us to be able to share in real time how to do something, specific tips or ideas. I feel like it's almost a way to get some fantastic PD! Just a few hours ago, Hope King (Elementary Shenanigans) was sharing how she uses music to engage students. In real time, peeps! How cool is that!? Even cOOler?! Periscope is going to be just as powerful, if not more, in the classroom! I'd already taken note of how Kayla Delzer over at Top Dog Teaching has her kiddos tweeting on their class Twitter account. Love it! Periscope is going to make tweeting even more amazing! If you have any more ideas to add to this list, please let me know in the comments! How cool is this? "Today, we're playing a game called Mama Mia. We've been learning about equivalent fractions.....this is a great way for us to practice". Or just record their conversation as they work on a task. Imagine parents being able to take a peek into what their child is doing in the classroom via Periscope! Amazing...right? A little caveat here -- I am not completely comfortable with kiddos broadcasting their faces....but you can broadcast a lovely presentation just by focusing on the artifacts being used: posters, models, manipulatives, etc. Even without faces, still a powerful way to both let kiddos share their learning & offer parents a glimpse into the classroom! Easy to get around the no faces issue with this one...most performances either require or use MASKS! Boom. Done. And think how dynamic this app is going to be for parents! An easy download on their smart phones & they'll be able to watch readers' theatres and plays right from their phones. Video stays live on Periscope for 24 hours, so parents can view broadcasts as they have time. Working on a special art project? Kiddos can set up a gallery & broadcast live. In my classroom, we do lots of 'museum' type projects where kiddos set up displays & we invite other classrooms in. With Periscope, we can also broadcast our museum! Think about the speaking & listening skills we'll be developing & polishing! Speaking of museums....how many times have you thought to yourself, "I'd love if my kids could see this?" Maybe you were at an event in your community, or a museum in the next town, or even just speaking to someone who has information you'd love your kiddos to hear. As long as you're going to be with your class in the next 24 hours, you can broadcast your visit or your conversation & then view it with your kiddos. Powerful? Yes! Record yourself running through an especially difficult problem, or perhaps even just explaining the assignment. Or better yet....have your kiddos record them! Families will be able to access the help over the next 24 hours. (No more "I didn't know what I was supposed to do"). My classroom is about 50% ESL...often, parents aren't able to help with reading the directions. A quick view of the broadcast should be enough for the child to remember what the task is supposed to be. LOVE this real life application for math! You know those assignments in math in which kiddos are supposed to ask others in the classroom their favorite snack or favorite animal? How super awesome would it be to have your kiddos Periscope the survey out? And parents (or even grandparents) can respond?! Wow. I can't even imagine how motivating that would be! They could even broadcast the data after it's all compiled! Personally, I can't wait to do this one! 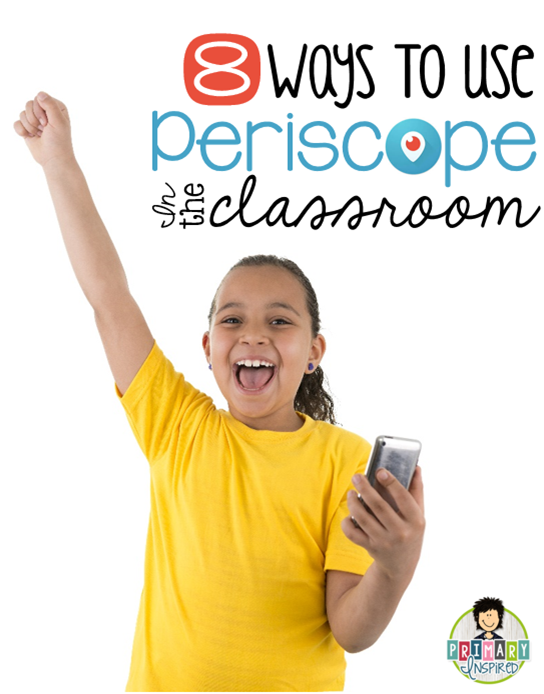 Interested in more ways to use Periscope in the classroom? Make sure you're following me (@fradyb1).....there are more to come! Enjoy this bright idea? Make sure to follow me on Facebook, Instagram, or Twitter, too for more great ideas!